« Lau mam » est une spécialité du sud et un mariage étonnant de conserves de poissons et hot pot aussi bien. 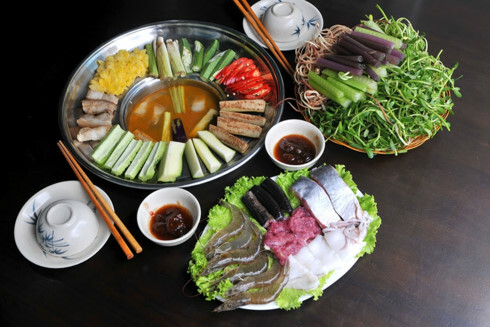 Fresh fish meat, water crab meat, snails, eel, slices of pork, silver shrimp accompanied with various kinds of vegetables, such as eggplant, bitter melon, water dropwort, “dien dien” flower , fèves germées, water lily, straw mushroom will be dipped into the boiled sauce until well-done. Pour cette raison, “Lau mam” is considered as one of the ideal dishes for vegetable-lovers. “Lau mam” is scoop out into bowls and served with handfuls of rice vermicelli also. Enjoying the winter bitter cold with a hot salted fish hotpot, a medley of flavors, spicy, amer, salé, sweet and greasy is not a bad idea!